This is a two-parter, however, alerting the viewer that another twist is on its way, or else there would be no second part. As Lana points out, Cecil could’ve called them to court and the end result would’ve been the same. Why fool them with the promise of a nuclear weapon Malory could ransom back to the United States? It’s left a smidgen vague, the writers making us connect the dots as opposed to doing it for us, but it would appear he needs ISIS’ help in stopping a rogue scientist of his from launching missiles tipped with nerve gas at three separate targets in the US. Are you seeing why I brought the word “convoluted” into play? The episode would’ve played fine if they stopped at the point when Cheryl found out Cecil’s plans to rob her of her inheritance and caused them to go awry. With this setup, we’re granted a double dose of Cheryl’s craziness. First there are the anecdotes her ISIS coworkers tell Cecil about her. Then there is her break with reality, which includes her hearing noises in her head that she recognizes and points out as being “non-diegetic.” That’s more than enough to hinge an episode on. 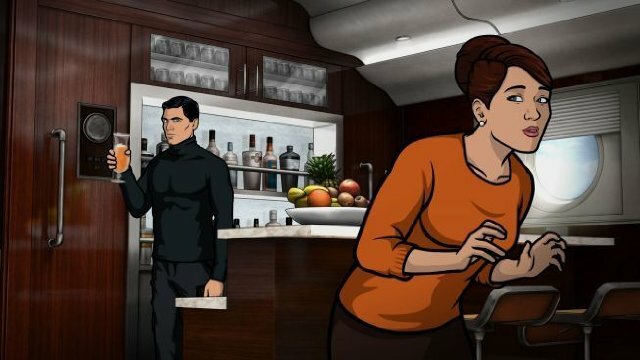 Why Archer chose to add another crazy to the mix at the last minute, rather than use Barry, “the old reliable,” I’m not sure. Earlier in the season, the writers looked to be building up to another climactic Archer-Barry showdown. Except this marks the seventh straight week that he’s been MIA entirely. Even if he were to show up next week to further complicate matters, it would be too little, too late. You don’t just pretend a character doesn’t exist for half the season, only to conveniently reintroduce him as an obvious means of ramping up the stakes, which is what him appearing would come across as. That being said, Barry’s a proven commodity, while Captain Murphy could go either way at this point, so his presence could still give part two a boost. At the same time, I fear that him appearing would cause things to grow even more convoluted than they already have. Which is why I would’ve preferred the writers kept things simple to close out the season, focusing on Cheryl’s relationship with her brother Cecil and his vegan girlfriend Tiffy (voiced by the wonderful Kristen Schaal), instead of trying to make the closing episodes as action-packed as in seasons past. Watching the two bicker was enough for me, and I’ll be disappointed if Schaal’s Tiffy doesn’t get some lines in “Sea Tunt: Part 2.” I also think they missed an opportunity by keeping Cheryl and Tiffy’s fight off screen (for the most part). Both girls have a bit of the crazy in them, so the animators really could’ve had some fun with it. They’ve been showing off in past weeks with car chases. Why not switch it up and show off with a little with an escalatingly violent fight? I realize there’s only so much room in the cockpit for them to work with, but they’re a creative bunch and I’m sure they could’ve thought of something. Anyway, my point is that, in general, I’m leery of the direction the writers are taking in these final two episodes. Unless Captain Murphy surprises me by being as capable a villain as Barry or anyone else in the show’s history, I anticipate “Sea Tunt: Part 2” will leave me with a bad taste in my mouth. Then again, Archer hasn’t let me down once yet, so I still have hope that I’m wrong. P.S. As I was finishing up this review, I was alerted that they were teasing a Sealab 2021 crossover, which went completely over my head given I don’t watch the show. Though something did seem familiar about Captain Murphy. I don’t know how this affects my view of where things are headed.